Working with community partners and area residents already involved in local food projects, our initiatives aim to provide the leadership and facilitation required to expand and strengthen local food production as well as consumer demand for locally-produced foods. Our video Northern Grown: How Thunder Bay is Feeding Itself was created through a partnership with Powerline Films and Sustain Ontario. The three excerpts, Roots to Harvest – Urban Agriculture in Thunder Bay, How are we going to feed ourselves in Northwestern Ontario and Leaders in their Field-Thunder Bay Producers, are important components of the Growing Good Food Ideas videos that were produced from footage from our video Northern Grown. The model (Figure 1) is endorsed by both the academic and community partners. From this perspective, the partnership embraces a fluid process that focuses on building resilience, robustness, diversity and ductility. This process assumes and accepts life’s vicissitudes. Formal and informal interactions occur within dynamic and ever-changing webs of networks that have no designated centre. Instead, these interactions are grounded within the context of each activity. The vision always remains the anchor for any actions. In this case, our vision is that giving students opportunities for community engagement in food security within academic course requirements will establish life-long learning skills to build the capacity of civil society and enhanced community well-being. Our community-based learning program is in constant motion as network interactions receive, relay and interpret information through both formal and informal linkages. 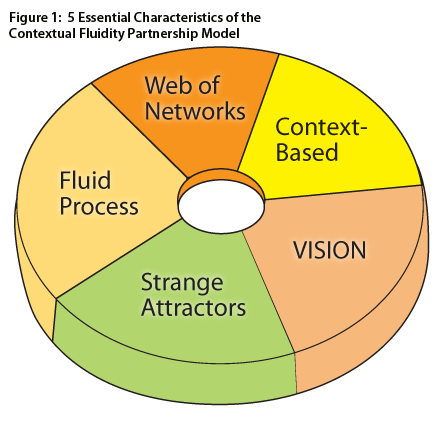 Further, the model of Contextual Fluidity endorses the ‘strange attractors’ of formal and informal, planned and unplanned, and conscious and unconscious interactions in distinct and at times distant parts of the partnership. This partnership model articulates community-capacity building principles that include a focus on vision as a driving force for action, the strength of multiple relationships, the building of shared values, the importance of participation in the process, a keen ear for listening to all community voices, engaging as a community member, a focus on strengths not problems, being opportunistic in using a diversity of resources, finding ways to respect and bring out the unique gifts of individuals and groups, placing more energy into the process than into definitive plans, accepting and building from mistakes, and engaging all.